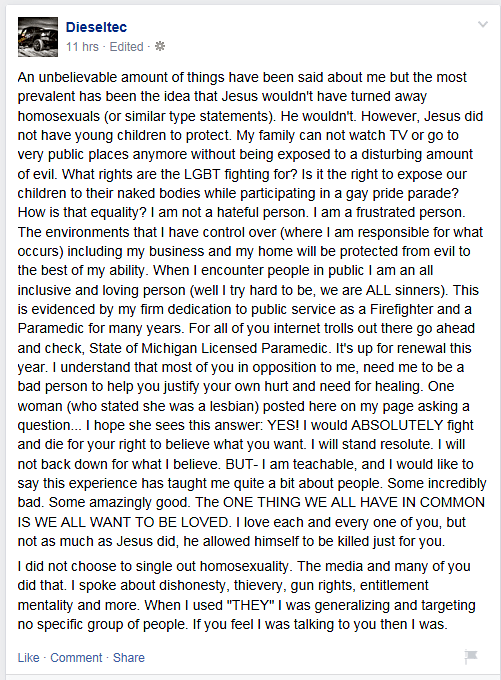 Dieseltec Bigot Brian Klawiter Doubles Down: "I Have Young Children To Protect"
An unbelievable amount of things have been said about me but the most prevalent has been the idea that Jesus wouldn’t have turned away homosexuals (or similar type statements). He wouldn’t. However, Jesus did not have young children to protect. My family can not watch TV or go to very public places anymore without being exposed to a disturbing amount of evil. What rights are the LGBT fighting for? Is it the right to expose our children to their naked bodies while participatin…g in a gay pride parade? How is that equality? I am not a hateful person. I am a frustrated person. The environments that I have control over (where I am responsible for what occurs) including my business and my home will be protected from evil to the best of my ability. When I encounter people in public I am an all inclusive and loving person (well I try hard to be, we are ALL sinners). This is evidenced by my firm dedication to public service as a Firefighter and a Paramedic for many years. For all of you internet trolls out there go ahead and check, State of Michigan Licensed Paramedic. It’s up for renewal this year. I understand that most of you in opposition to me, need me to be a bad person to help you justify your own hurt and need for healing. One woman (who stated she was a lesbian) posted here on my page asking a question… I hope she sees this answer: YES! I would ABSOLUTELY fight and die for your right to believe what you want. I will stand resolute. I will not back down for what I believe. BUT- I am teachable, and I would like to say this experience has taught me quite a bit about people. Some incredibly bad. Some amazingly good. The ONE THING WE ALL HAVE IN COMMON IS WE ALL WANT TO BE LOVED. I love each and every one of you, but not as much as Jesus did, he allowed himself to be killed just for you. Is he kidding? His middle name should be bigot.